The Red Sox struck for four runs in the bottom of the first inning - three off the bat of Eduardo Nunez - as they beat the Orioles 7-3 Friday night at Fenway Park. 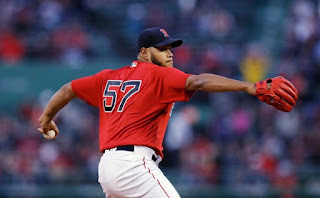 Eduardo Rodriguez (pictured) provided Boston with yet another strong outing by a starting pitcher going six innings for his first win over the year. He allowed one run on five hits and two walks while striking out eight. Rafael Devers led the Red Sox with three hits including his fifth double of the season. Nunez, J.D. Martinez and Tzu-Wei Lin each had two, as part of an 11-hit attack. With the win, the Red Sox improved to an American League-best 11-2 record. Boston's last 11-2 start came in 1918.